I wanted to be proactive about my financial health this year and figured that tracking expenses with an app isn’t a huge task.That’s part of why so many New Years’ resolutions fail, because people are vague about their goals and there are so few specific action items. Using an app to jot down some expenses isn’t a huge commitment and my phone is with me all the time anyway, so it’s a constant reminder that I have to be aware of my purchases. When I started by feverish hunt to for an expense tracking app, I was determined not to use Mint. I use Mint already to manage my bank accounts and loans because it’s convenient to view all my accounts together in one portal, but Mint is awful with categorising. It’s always so wildly wrong (Paypal always gets categorized as shopping,always) that I might as well enter all purchases myself. Mint also can’t track cash purchases and while this payment method may be falling by the wayside for some people, not for me! So really, all my financial habits tell me that I’m better off divorcing myself from Mint when it came to looking for an expense tracker. I stumbled upon Saver first in my hunt for an app. It’s not free, which I wasn’t too thrilled about, but pie charts! colours, slick designs! I was sold. Saver is my favourite app out of the handful I played around with, and after MBT’s two-week challenge, it’s the one I’ll continue using. The app is $4.99 in the iTunes store, and it allows me to catalogue all my expenses as easily as possible. Once I started diligently tracking my expenses, I realised that bookkeeping is hard and while not a huge commitment like I mentioned, it does take some time. But anything worth doing takes time, right? Adding expenses on Saver is easy. This shouldn’t be considered a pro, but you would be surprised at how counterintuitive it is to find a simple “add expense” button on other apps, often buried under various pages. On Saver, just enter the amount of a purchase, select from 15 choices to categorize your purchase, and if you so please, enter a tag for it and some notes about the purchase. My favourite thing about Saver is how it takes your expenses and compiles it into interactive pie charts by time period, and then by category. You can look at how much you spent on groceries for the month of January, for last week, or for 2013 thus far. 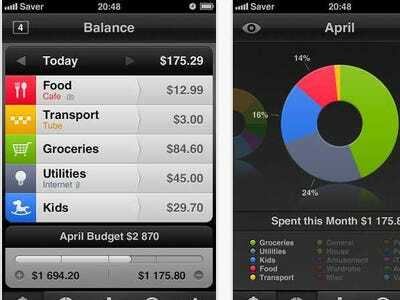 I personally prefer pie charts over other kinds of graphs, so this app has been extremely helpful in allowing me to visualise my expenditures. If there were an additional feature I would like to add to Saver, it would be the ability to log recurring expenses so that I didn’t have to do it manually every month. I have automatic debit set up for my loan repayments and recreational expenses (gym, newspaper subscriptions) that I get charged for monthly, so it would be nice to not have to remember to enter those manually. Being able to track a recurring expense is a feature that Toshl Finance does offer. The tradeoff is that Toshl isn’t as slick, and has a heavier slant on budgeting, which was not something I was looking for. I find expense tracking to be a good financial exercise, but I’m not big on budgeting, which feels restrictive. As long as I don’t overspend and have a clear picture of how much I’m spending, I don’t feel the need to budget. But for budgeters, Toshl Finance has many convenient options. There are options to budget by category (for example, a $200 monthly budget on groceries) and to budget by timespan ($50 for all expenses for the week). There’s even the option to let any unused money in a budget to roll over to the next week or month. There’s greater flexibility with categorising within Toshl: you can create all the categories to your heart’s content, though some users may prefer a preset number of choices. The app for Toshl is free, but Toshl offers both free and pro accounts. With a pro account, there are options to export your financial data in more formats, as well as more budgeting options. It is currently priced at $1.99 monthly or $19.99 for the year. Toshl is available on the web for both account types, in a similar way that users can access Mint via web or app. You can view expenses by month and by tag in charts that are nicely-designed and easy to interact with. You can enter your expenses and snap a picture of an accompanying receipt, and file it to a specific expense report. Expensify lets you log hours spent on a project, as well as any car mileage and car expenses used for a business trip. Analytics are not available on the app, but are accessible through the web version of Expensify, where you can view your expenses as illustrated through line graphs, pie charts, or bar graphs. The Expensify app is, at the moment, a little lacking. The Expensify experience is much richer on the web version, which is a con for users who want to be able to review expenses in-depth on the go. Expensify has a robust system online that allows smaller businesses and bigger corporations to add employees to an Expensify account. Features include integration with various external accounts (Evernote, QuickBooks, FreshBooks) and direct deposit reimbursement. Expensify is effective for businesses, but ultimately, because I was looking for a personal finance product, I couldn’t get much use out of it.